Valentino Rossi is a legend in Grand Prix motorcycle racing. Fans around the globe cheer for the charismatic Italian and he responds with flamboyant post-race celebrations and riding style that always attracts attention. The Doctor became a Champion of all three GP series, 125, 250, as well as the final year of classic 500cc racing. Rossi joined Mike Hailwood and Phil Read as the only men to have accomplished this task. Valentino has been going by the motto of "one year to learn, one year to win" throughout his GP career. Rossi began racing GP in the 125 class in 1996. The following year he became the youngest ever GP champion at age 16, winning 11 rounds along the way. He was moved up to the 250 class in 1998 where he finished 2nd with 5 wins. In 1999 he once again become a champion, (the youngest 250 champ to date), dominating the series with 9 victories. Next up: 500GP aboard the venerable Honda NSR. In 2000 young Rossi finished behind Kenny Roberts Jr. and returned in 2001 with a mission: To become a 500 GP champion. He did just that. After a year long battle with rival Max Biaggi, he wrapped up the championship with 11 victories and established himself as one of the greatest GP racers of all time. The most dominating rider since in the modern era, the unthinkable happened when Rossi lost his title to Nicky Hayden in 2006. Rossi's failure came when he crashed during the season finale at Valencia, losing his points lead to Hayden. Sporting the Excalibur motif on his 2007 preseason factory Yamaha, the unspoken message from Rossi was loud and clear: The once and future king is dead set on recovering his crown. The Doctor fell short in 2007, however, losing his supremacy to Ducati's Casey Stoner and finishing the season third in the championship. 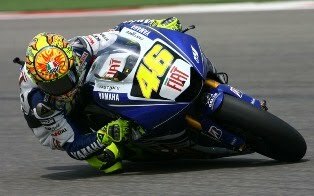 In 2008 Rossi took Fiat Yamaha and switched to Bridgestone rubber, the same slicks as Stoner. The result was yet another dominating season from The Doctor and another MotoGP crown. The following year Rossi repeated the feat, scoring yet another world title. The Doctor had to work for it, however, with his greatest competition coming from across the garage in teammate Jorge Lorenzo. Thank you for visited me, Have a question? Contact on: youremail@gmail.com. Please leave your comment below. Thank you and hope you enjoyed ... ??"